I think Wayne Cordeiro is one of the most significant Christian leaders I know of, so I pay attention to whatever he writes. His insights come from a lifetime of effective ministry; he has been a practitioner, someone in the trenches, and he has the scars and the wisdom to show for it. The Irresistible Church gives a great overview of what a biblical church should look like. Any church that manifests the 12 characteristics he outlines here will be a healthy church that changes lives. The two traits that stuck out to me as I was reading were that “an irresistible church promotes self-feeding” and “an irresistible church has a plan.” I find that both of these are challenging, and few churches I know of actually do both. to do it. I was told, as a new believer, that I should have a “quiet time” to meet with God. But I was never actually told how to have one, what I should do during it, or how to connect with God in a real way. I was kind of on my own to figure it out, and I don’t think I’m unique in that respect. of direction, but few take the next step of developing plans to accomplish those goals. Planning is not something in which pastors are usually trained. It can be learned, but it’s easier to give our time to all the other things that have a claim on it. Easier isn’t always better! I don’t believe that any of us can become the kind of church God calls us to be without planning. I’m writing this as I am about to begin planning the next season of life for our church. It’s a helpful and challenging reminder about the importance of engaging in the process. What did you take away? How is your planning going? In between planting churches, I worked for a while for a marketing company, and there was one axiom I heard over and over when people were looking at the ads that companies would send in to us and that was that “Less Is More”. It was super common for companies to design ads, like for a magazine, that were packed full of information, they wanted to let people know what a wonderful product they had and to communicate, all the benefits so that people would buy. Unfortunately those ads often didn’t work, they had so much information packed into them and the page would get so crowded, there was no place for a reader to focus, so they wouldn’t even look at the ad and just turn the page. Less Is More we’d say when we saw an ad like that. The best ads usually had a strong headline, a good picture or graphic of some kind and a few lines of copy, and although there was a lot less information, those ads will do better because people would stop and look at them. They had a focus and weren’t just cluttered. Now the same principle applies to life – Less Is More. One of the biggest things that stops people from being really effective, from making the impact that they could have, and from having the life they could have, is that they’ve just got too much going on. Less is more is means intentionally choosing those things that are most important. The things your best at, those few things that really make a difference, and let the rest go. Delegate it or drop it, but don’t put any more effort into it than you absolutely have to. Then do real quality work on the most important things. In the book the 5 Choices, the authors put it this way; the key to true productivity is not to get more things done, but to get the right things done, the important things, with the highest quality you can achieve. It’s not about doing more with less but doing more about less, it’s about concentrating more of your very best attention and energy on those few priorities that really matter and getting them done in the midst of the new or the inevitable gravel that’s in our lives. I know this isn’t easy, especially at the beginning; you may get resistance from other people and resistance from inside your own head. It can seem like it’s selfish. It will take courage and determination and discipline, but it is worth it. The end result over time will be that higher productivity and more satisfaction in life with less stress; and the people around you will notice a difference and they are eventually going to want to know your secret. Focus on the most important things and do those really well, you will see a huge payoff. If You Want It Done Right, You Don’t Have to Do It Yourself! For anyone in leadership, delegating effectively is one of the most important skills to learn. I think it’s also one of the least well-developed skills, especially in the church. Few pastors have had any training in how to delegate effectively. From what I’ve seen, pastors tend to make one of two mistakes. The first is to not delegate at all. Pastors who make this mistake usually fall into the “no one can do it as well as I can” kind of thinking. Ironically, that’s often true, at least, at the beginning. However, the problem is that no one ever will be as good as you if you don’t train them by delegating. It’s very short-sighted thinking. The other mistake is to assign tasks and call it delegation. In this case you are giving people specific, isolated tasks to do, and when they are done, they need to come back to you for the next thing. There is no autonomy or responsibility for them to exercise. They are just following instructions. This is deceptive because it looks like you are delegating when you actually aren’t. Implicit in delegation is the idea that people are free to do things in the way they want, as long as they get the job done properly. There are several problems that come when you confuse delegation with assigning tasks. In this case you can really only give low-level tasks away. That won’t change your workload, it won’t develop your people, and it certainly won’t ensure successful results. Underneath it all, delegation is a skill that can be learned. It does not come automatically to most people, which means one has to work on it intentionally. 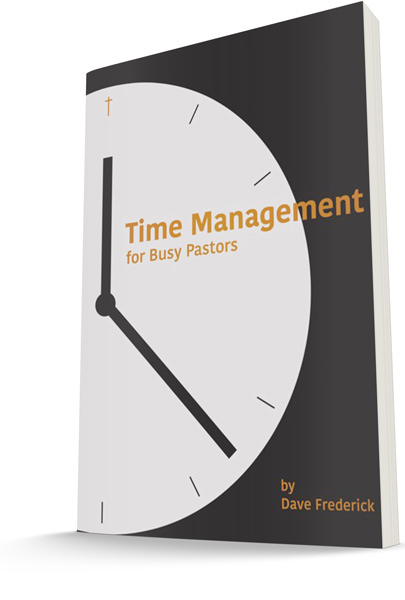 I think any pastor can learn to do it; he or she just needs to take the time. That can be a challenge because at first it doesn’t feel like productive work. Eventually, however, it becomes the key to greater productivity than ever. What has worked for you? What has been frustrating, or unsuccessful? Hey Guys, it’s Dave Frederick and this week’s Leader’s Tip is simple. As a leader you need to be clear even when you are not certain. One of the biggest things that hinders and organization from accomplishing what it could, is that the Leaders aren’t clear on where they are going or on why they want to go there. So the most common leadership mistakes around, I know I am guilty of it many times, we just aren’t clear with our people about what we want to see happen. Sometimes that is because of a lack of communication skills. More often though, I think it is because we aren’t sure that we’re right. If we’re not sure we’re right about that direction we tend to hedge our bets by being vague. But that almost guarantees that nothing will happen, at least nothing of real importance. As a Leader we need to push past the fear that we aren’t right. Setting direction and casting direction always has a subjective aspect to it. It seldom, if ever a case of being right or wrong, we aren’t talking about morale issues here. So even if you aren’t absolutely sure you’re right, you owe it to your people to be clear, to be as clear as possible. You can even acknowledge that you aren’t absolutely sure it’s the perfect answer or the right direction. And you can acknowledge that a case can be made for something else, that’s fine. Cause it’s true. But at the end of the day, if you’re the leader, you have to make a call. You have to set a direction and you have to be clear about it. People may disagree with you, but they should have no doubt about what they are disagreeing with. Now let me be clear again, I’m not saying you have to insist that you are right. Clarity isn’t certainty, that’s not the issue and it’s not helpful to focus on that. But if you believe your church or organization is supposed to focus on reaching out to your community, for example. You have to be clear about that. Be clear about where you are going, why you are going there and how you’re going to get there. If people disagree, that’s fine, it doesn’t mean they are bad people, and it doesn’t mean that you are wrong. Just don’t let them be confused because then nothing will happen either good or bad, and both your people and you will be frustrated. So be clear even when you are not certain, you’ll be amazed at the difference it will make. This week’s Leader’s Tip is simple. As a leader you need to be clear even when you are not certain. One of the biggest things that hinders and organization from accomplishing what it could, is that the Leaders aren’t clear on where they are going or on why they want to go there. Danny Cox covers a lot of ground in Leadership When the Heat’s On. I found that a lot of his paragraphs could easily have been expanded into full chapters. I suspect there is something for just about everyone here. There were three particular insights of which I made note that I thought were worth particular attention. First was this: “Many people are much more familiar with mediocrity than they are with success, and therefore lack the drive to pursue goals. Fear of success is natural if you have little experience with it.” I’ve become increasingly aware of how common it is for people to fear success. Mediocrity is comfortable and safe—to pursue success forces us to stretch and grow, something many of us don’t like to do. We have often never been challenged to do it, and our fear of failure can kick in at a whole new level. I’ve also seen that some are afraid of success because of the increased expectations that follow. Once you are successful at a particular task, people expect that excellence, which creates a new level of pressure. Some people will sabotage themselves so as not to succeed—and then fail at a higher level. As leaders, we need to be able to walk people through those fears and help them step into a higher level of success. The second thing that struck me was: “To mentally prepare for problem solving, you must first commit yourself fully to solving the problem. This means making a strong commitment to yourself and your organization that the problem you’re presently facing will not come back for lack of a sound solution.” Reading that made me wonder how often it happens that we really commit to fully solving a problem. Often we settle for putting band-aids on the problem—making it look better, or not be as bad, but not really solving it at a fundamental level. Of course, when we do that, the problem always comes back because it was never really dealt with in the first place. Being an effective leader means really addressing problems until they are resolved. That means we will likely keep pressing long after those around us are ready to move on, and they can even get annoyed with us for not letting it go. As leaders, we have often spent many hours thinking about an issue or planning a new initiative. By the time we start talking about it, or are ready to move on it, it’s old news, but it isn’t old news for the people around us. We need to be careful to walk them through the idea and the implementation so they don’t feel blindsided. If they do, we will never have their full commitment or their best efforts at making it happen. Their confidence will be undercut, and they will act tentatively. On the other hand, people who know what is happening, and why, will give their best efforts and greatly increase the odds of success. So what were your take-aways? And what have you learned about leading when the heat is on? What’s the key to stepping into results that you’ve never gotten before? Today we look at the key to how to do just that. Hey Guys, Its Dave Frederick with this week’s Leaders Tip. There’s an old saying that you might be familiar with, it goes like this. It says, “If you do what you’ve always done, you’ll get what you’ve always gotten”, and that is a basic truism of life. There’s a corollary to that if you turn it around a little bit, that says “If you want to get something you’ve never gotten, you’re going to need to do something you have never done.” I’ve got that saying taped above my desk, because I have found it to be so true. A lot of us want a different life or a different result in some area of our life. We’d like to have better health; or more or better relationships; we’d like to be more financially secure; or do better at work. Unfortunately what a lot of us do is, when we think about that, we think I just need to do more of what I am already doing. And we try to do more, which takes more time and energy, but usually does not get the result. We get frustrated, because the answer usually isn’t more. A good definition of insanity is to think if I keep doing the same thing over and over I am going to get a different result, it doesn’t work that way. Sometimes what is required is something different. So let me give you an example, a few years ago I had gotten seriously over weight, and I started to do some triathlons to get back in shape. I started doing that and did some short ones, but then after a while I started thinking I would love to do one of the long ones, like a half iron man or an iron man. A half iron man is a mile swim, a 56 mile bike ride and a 13 mile run (a half marathon), it’s a pretty demanding race, and I thought to do that I am just going to have to really ramp up the mileage. But then I got smart and I hooked up with a coach, and the coach sat me down and said “no, no, no” and he changed my work out completely. He said it’s not just about all these miles, you need to change how you are training and he put together a whole plan for me, and then this past summer I finished my first half Iron Man. I wasn’t super-fast, but I finished it and finished it well. I had to change my training, change my whole workout, and approach to working out in order to get that result. That’s how it is with life. If we want a different result, we need to think not in terms of more, but different. So let me ask you. Take a look at your life, is there an area that you would like to have a different result in? Would you like to have a different result in your health or your relationships, your finances, your work or something else? Where do you want something different than what you have right now? The answer isn’t going to be just trying to do more of what you are already doing. The answer is going to be do something different. Maybe you need to stop something you are doing. Maybe you need to start something new. Maybe you need to just change what you are already doing. Don’t think in terms of more, think in terms of different. If you want to get something you’ve never gotten, you’re going to need to do something you’ve never done. Go for it! Friendfluence has some significant implications for understanding relationships and the development of communities within the church. Flora brings new insights, as well as providing more depth for truths I have known. Although there were an abundance of things I took note of in the book, I will just mention three. The first is the number of people we relate to. “We have five intimate friends. Fifteen close friends, 50 good friends, 150 friends.” Those numbers are well-documented and have stood the test of time. The implications for church size, and small group size, are noteworthy. But I do not know of any churches that intentionally structure themselves around those numbers. I wonder what would happen if we did? I suspect we would see the level of community deepen, even apart from scheduling activities and doing other things to build community. For large churches, it would be worth taking the time to figure out how to maintain those kinds of numbers within the larger body. The second thing that struck me was the difference in how genders naturally relate. Girls tend to talk about their problems, which brings them closer together but can make them vulnerable to depression; boys don’t think of that as a good strategy. It is not news that men and women are different, and that they relate differently. It is certainly worth taking those differences into account when thinking about small groups and same-gender ministries and activities. Finally, the impact of having friends on our life spans was something I took note of. It was a surprise to read that having friends had a different effect than having a spouse, and that having friends is more significant for our longevity. I do not fully understand that—I would have put all relationships in the same category. But it does highlight the power and importance of being in a community. For a church, it emphasizes that we should not take the development of community for granted. We need to plan for it: plan for how to help new people plug into it, and plan ways to help people make connections. As leaders, we cannot guarantee anyone that they will develop intimate relationships or even deep friendships, but we can create opportunities for those relationships to happen. We should do everything we can to make it possible, even while realizing our limitations. The benefits derived from developing friends are worth the effort. And frankly, I suspect it will lower the pastoral load of many pastors if the bonds within the community are strong. Many issues will be dealt with before they ever come to our attention. The power of friendship is huge; it’s worth cultivating within our church communities. How have you seen this at work?